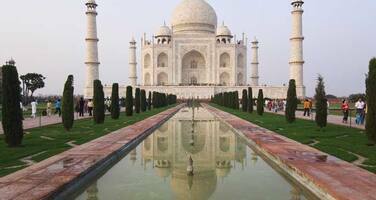 In September 1996, the “Taj Protection Mission Management Board” (TPMMB) was set up as per suggestions of the Supreme Court of India for the environmental protection of the Taj Mahal. Consequently the TPMMB was formed under the Chairpersonship of the Chief Secretary of the State Government of Uttar Pradesh. The TPMMB was to approve various schemes for the protection of the Taj Mahal and request the release of funds from the Central Government Ministry of Environment & Forests. In mid June 2003, the WH Centre received numerous press releases concerning a large-scale commercial development plan in the immediate vicinity of the Taj Mahal and Agra Fort World Heritage properties along the Yamuna River. The proposed plan, according to the press, included large-scale landfill of the Yamuna River bank to construct shopping complexes and tourism facilities. Accordingly, since November 2002, the TPMMB had begun the implementation of a US$ 35 million ‘Taj Heritage Corridor Project”, without consulting other agencies responsible for the conservation, management and development of the properties. Reportedly, this "Taj Heritage Corridor Project" proposes an alternate access to the Agra Fort and Taj Mahal WH properties, envisaging commercial development along 2km of the riverfront between the Taj Mahal and Agra Fort. 1.6 km of 1.5 metre-high landfill along the Yamuna River bank has reportedly already been completed at the cost of US$ 6.9 million. The adverse impact of this new development to the two WH properties so far appears to have been caused by the alteration in water table and change in the flow of the Yamuna River, and in particular, may have affected the structural stability foundations of the Taj Mahal. The Taj Mahal's superstructure base was designed and constructed on the Yamuna River's sand taking into full consideration the natural hydraulic pressure and river flows. While the monument has very slowly and gradually been sinking with the passage of time, this process may have been accelerated, according to some reports, due to the recent changes of the river flow and hydraulic pressure caused by the mass landfill in the immediate vicinity of the monument's base. In addition, altering the Yamuna River course may cause irreversible damage to cultural heritage properties located along the river between the Taj Mahal and Agra Fort, which are intrinsically linked with the heritage values and history of these two properties. These include, the Etmad-ud-Daulah Tomb (1622-25 A.D.), Chini-ka-Rauza Tomb (1639 A.D.), Sarai Nur Jahan Mughal Inn (early 17th century A.D.), Battis Khamba monument (1615-20 A.D.) and Mughal Gardens such as Mahtab bagh, Ram bagh, Buland bagh, Zuhra and Sayyid-ka-bagh. This TPMMB project appears to be in direct contradiction of the Agra Master Plan drafted by the Town and Country Planning Department of the Uttar Pradesh State Government with the Agra Development Authority (ADA) in 2001, which designated the WH properties and their surroundings as a ‘National Park’, distinct from residential or commercial use. No environmental or heritage impact assessment studies appear to have been undertaken before the design and execution of the project. Moreover it appears that none of the concerned authorities, such as the Archaeological Survey of India (ASI), the Central Water Commission (CWC), the Central Pollution Control Board (CPCB), the Agra Development Authority (ADA) and the Agra City Municipal Corporation (ACMC), were consulted during the design and execution of the project. On 18 June 2003, the WH Centre requested the authorities via the Permanent Delegation of India to UNESCO for clarification and detailed information on the proposed plan and its execution. 6. Requests the State Party to consider establishing a co-ordinated and effective management authority for the World Heritage properties in the Agra area, which would include the three World Heritage properties of Agra Fort, Taj Mahal, and Fatehpur Sikri. 7. Requests the State Party to submit a report to the World Heritage Centre by 1 February 2004 on the state of conservation of the World Heritage properties, Taj Mahal and Agra Fort, in order that the World Heritage Committee can examine the state of conservation of the properties at its 28th session in 2004. The report should include, if possible, the results of the environmental impact assessment study being undertaken by the Central Power Water Research Centre, as well as the final decision of the Supreme Court concerning the implementation of the development plan, the "Taj Heritage Corridor Project". 1. Expresses grave concern concerning the report on the large-scale tourism development plan in the immediate vicinity of the Taj Mahal and Agra Fort WH properties, which may irreversibly negatively impact upon the World Heritage value of the two properties, as well as the heritage values of the related properties in the Agra and Yamuna River areas. 2. Requests the WH Centre and ICOMOS to undertake a Joint Reactive Monitoring Mission to hold consultations with the State Party concerning this development project with a view to elaborate corrective measures for enhanced conservation, management and development of the WH properties of Taj Mahal and Agra Fort. 3. Requests the State Party to reconsider the on-going implementation of the project based upon a full analysis and assessment of the impact such major development plan would cause upon the WH properties of Taj Mahal and Agra Fort, while simultaneously assessing the damage already caused by the landfill in the Yamuna River between the Taj Mahal and Agra Fort. 4. Requests the State Party to consider establishing a co-ordinated and effective management authority for the WH properties in the Agra area, which would include the three properties of Agra Fort, Taj Mahal, and Fatepur Sikhri. 5. Requests the State Party to submit a report before 1 February 2004 on the state of conservation of the World Heritage properties Taj Mahal and Agra Fort for the Committee’s examination at its 28th session in June 2004.